There were two impactful rich media innovations this week. HP executed a takeover on MSN India introducing the Envy TouchSmart with an execution that simulated the product’s touch premise. 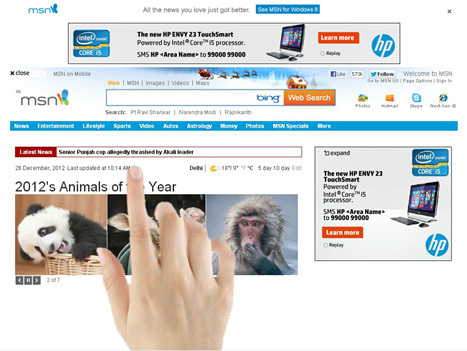 In animation, a finger is shown getting elements together on the MSN Home Page ending with the brand communication. 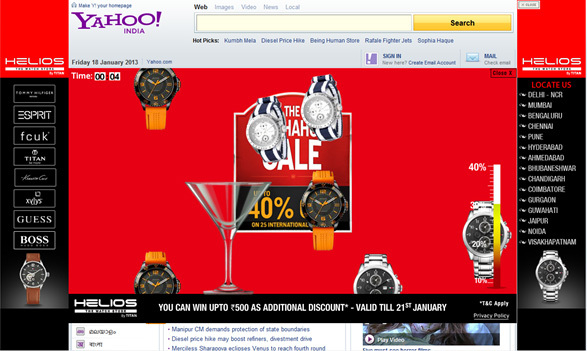 Helios Watch Store executed a smart Game in Banner on Yahoo! India’s home page where users had to catch as many watches as possible within 10 seconds by moving around a glass with their mouse. A discount meter showed how much discount they have been able to score. Users could enter their email address and phone number to get the discount coupon. Great way to promote a limited-time Store Sale.